Just made dinner for a friend and it was adorable and delish, so I had to share. As I strolled through the farmers market this weekend I ran across fairytale eggplant for sale and I HAD to buy them because my friend RD told me that if I ever ran across these lilliputian veggies I needed to try them. Fairytale eggplant is supposed to be less bitter than plain old eggplant, plus its adorable. At first I was going to make them into some sort of Indian curry dish, but at the last minute I decided to make mini eggplant parmesan instead. I cut each little eggplant int0 long halves or thirds and let them sweat it out for about thirty minutes. Next I breaded each with Italian panko crumbs and baked them at 350 until they looked to be done. I sprinkled them with an italian cheese mix and stuck them back in the oven on broil to melt the cheese. Then I took about seven slices and laid them across a bed of pasta covered in spicy tomato sauce. Yummy! I highly recommend this dish for entertaining or as a little treat for yourself. 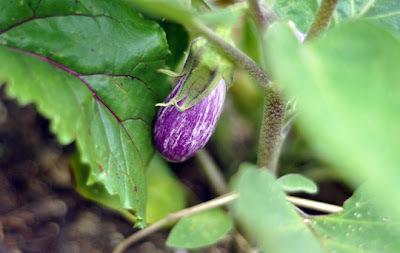 aww fairytale eggplants are adorable! ur recipe sounds delicious. i'll have to try it out sometime. thanks for sharing! Wish we have fairytale eggplants here. And the dish you cooked up with it sounds so yummy. chicky, I need an email from you. I'm going to be in Orlando next week and I flail.